This lovely pair of amethyst and sterling-silver scallop shell earrings would make an ideal present for a lady embarking on a new adventure in their lives. They are symbolic of the Camino de Santiago walk (the 1,000-year-old pilgrimage to the shrine of St. James in the Cathedral of Santiago de Compostela), with the addition of Amethyst gemstones, which are said to instil calmness, balance and peace. 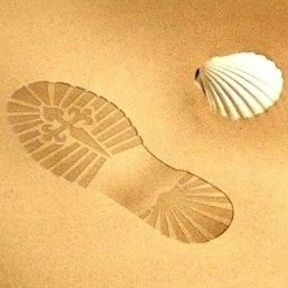 Some 200,000 pilgrims travel the Way of St James each year from all over the world, and many carry with them a scallop shell symbol like this. Wish your friends or loved-ones well by sending them this inspirational present. It is the ideal gift for people as they travel through life and face its challenges: It shows someone that you really care. 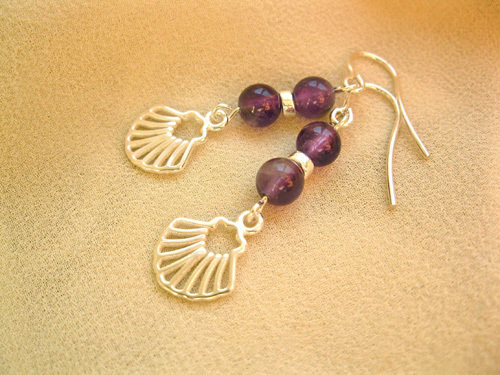 Dimensions: The earrings consist of 6mm amethyst gemstone beads and sterling silver open scallop shells and ear wires. They measure approx 10mm wide x 40mm in total length from the loop of the wires to the bottom of the shells. Gift our unique Camino Finisterre earrings to inspire your friends. They come gift-wrapped, like all our presents - and we can print a personal message on your behalf. Amethyst is the stone of the mind - a spiritual and mystical gemstone that is highly prized. It is believed to instil patience, balance, calmness, and peace. Amethyst makes an ideal gift for challenges like exams and competitions that need thoughtfulness, calmness and intellect.